You might not realize how important your thermostat is to your HVAC system—many homeowners don’t. But something as small as a thermostat upgrade greatly boosts the efficiency of your HVAC system. The vast majority of homeowners have a digital, programmable thermostat. While this technology is adequate, we now have even better systems available that work with you rather than forcing you to work around them. If you’re looking to increase your HVAC efficiency by upgrading your thermostat in New Braunfels, TX, now is the perfect time to do so. How Does Upgrading Your Thermostat Help with Energy Efficiency? There are several ways you can improve the energy efficiency of your air conditioning system, but one often overlooked option is updating your thermostat. Thermostats have come a long way since the days of the mercury-based dial thermostats, and today’s models can offer ease-of-use, convenience, and, best of all, better energy efficiency. 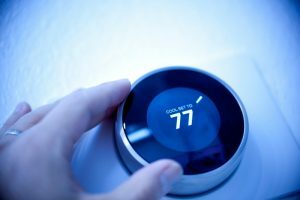 If you’ve been looking for a way to improve the energy usage of your cooling system, it may be time to consider a thermostat upgrade in San Antonio. Cowboys Air Conditioning & Heating has a wide range of thermostats from which to choose, and we can help you install a thermostat that will be a great fit for your needs. Posted in Thermostats | Comments Off on How Does Upgrading Your Thermostat Help with Energy Efficiency?